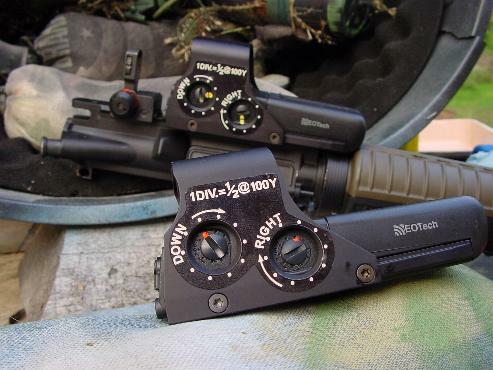 These are the solution if you've ever had trouble adjusting the windage and elevation on your EoTech sight. EoTechs are great sights but even daily users sometimes have trouble remembering which adjustments screw is which, what direction to turn it to move the point of impact in the desired direction, and how much each "click" moves it at what distance. Some of the info is on there, but in very small, debossed characters, in black-on-black, and recessed below the access holes in the aluminum protective shroud. 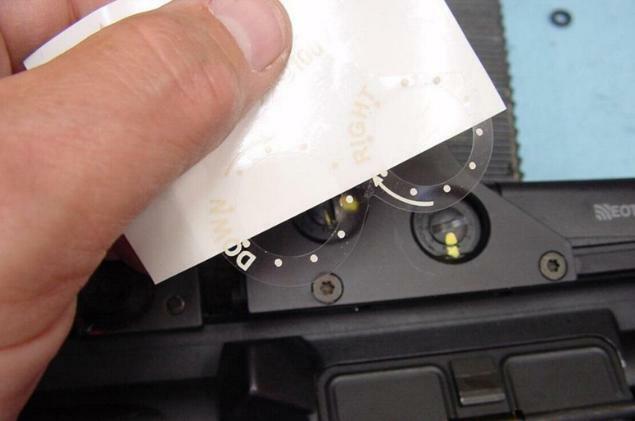 The EOSticker is easily located over the access holes and makes it easy to get the adjustment right, right now, without a flashlight, magnifying glass, and owner's manual. Characters are in a desert tan color to stand out against the black shroud. Reccommended installation procedure is to thoroughly clean the hands and the shroud surface, remove the sticker from its backing and replace it on the backing with the bottom half of the holes hanging off; this way the rest of the backing makes a good, non-sticking "handle" to hold it all by while you get the line-up right. Stick the bottom half in place, peel the backing off the top half, and finish the job. EoStickers are made from quality materials, and properly installed are very durable, but like any sticker they are not resistant to being soaked in oil or solvents. Available from Brownells and LaRue Tactical.